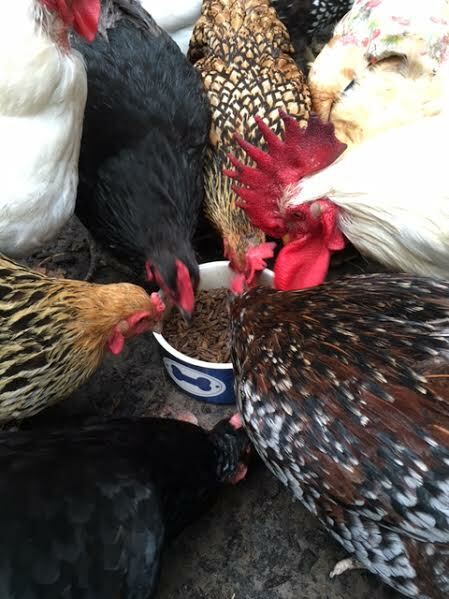 Chickens love grubs and mealworms. Feeding these high protein dried insect treats during molting, increases the protein fed to the flock. 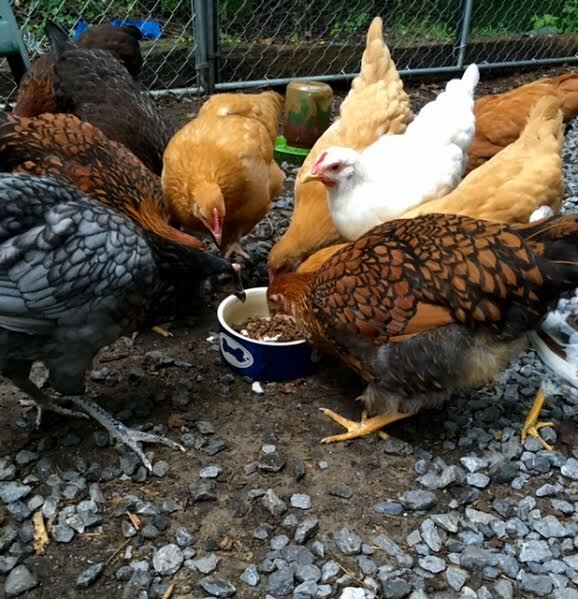 Increasing the protein is one of the positive things you can do to help the chickens recover quickly and easily from the hard, seasonal, fall molt. 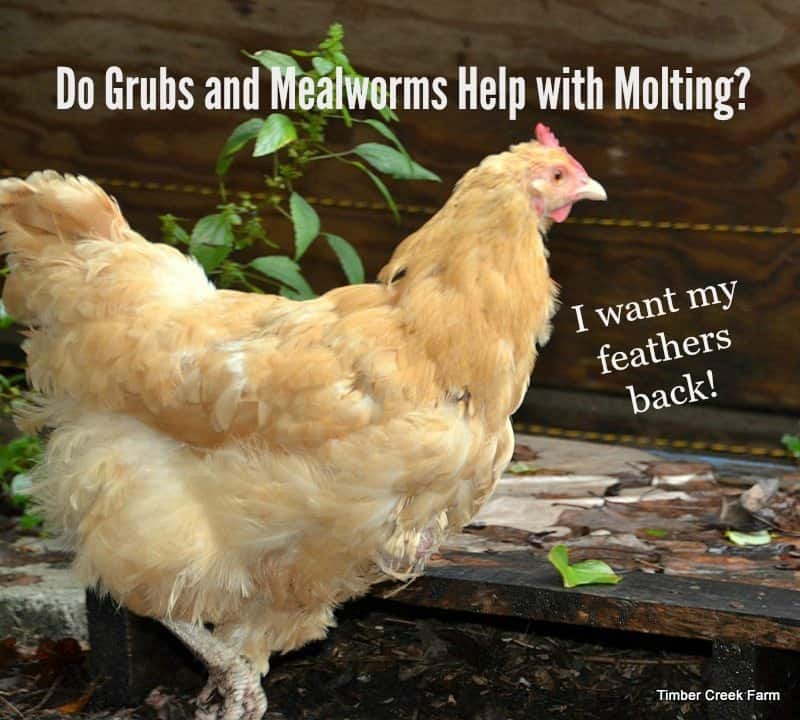 Take a look at some of the facts about molting in chickens and why feeding grubs and mealworms to the birds is so beneficial. 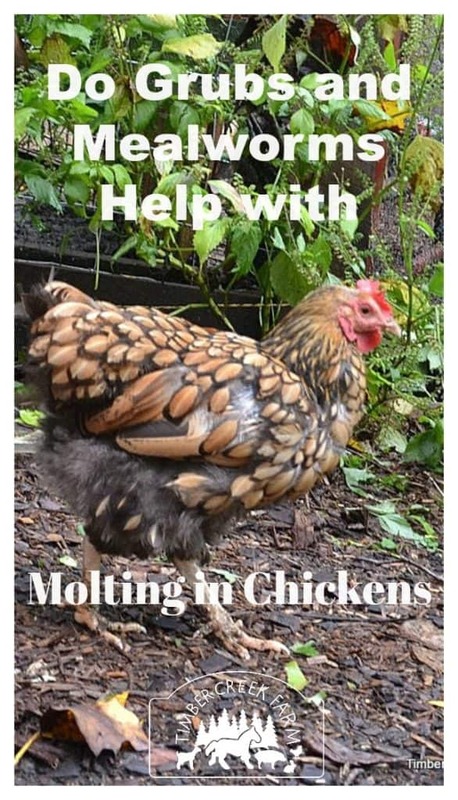 What is Molt in Chickens? During the seasonal or yearly molt, your chicken will lose a large percentage of her feathers and actually look rather depleted and unwell. Some chickens weather this phenomenon easier than others. Different years can hit the same hen with different strengths of molting. The first molt a chicken encounters is in their first few months of life. The chickens will go through this “baby” molt and lose the baby feathers, sometime after the first three months. Mostly this molt is seen as piles of downy feathers gathering in the corners of the coop. The chickens don’t look as war torn as their older coop mates, who are going through a full molt. The second molt in your chickens life occurs between 10 to 12 weeks of age. Often called the juvenile molt, the chickens will lose the baby feathers and begin to grow in the first grown up chicken feathers, getting them ready for winter. At this stage your juvenile chicks are still eating a starter ration, typically higher in protein, so their nutritional needs are being met. As the days begin to shorten, after the Summer Solstice, the first molt will be triggered in your older chickens. Molting as an adult chicken is necessary as they prepare for winter. Having broken, damaged, dirty and old feathers is not optimal for the cold weather. Healthy feathers are used to keep the chickens warm. Molt typically begins to show on the head and neck and proceed down the sides and back of the chicken. Not all chickens follow the typical pattern or we notice the molting once it has reached the back and sides of the bird. Hens and roosters both have a seasonal molt. Feathers and eggs are both high in protein. The chickens cannot keep up with the demand and the egg production will go on standby until the molt and recovery are over. Once the hen has regrown her feathers and is fully able, egg production will begin again. Although, this is often the same time winter and lower egg production due to less daylight. Have no fear. The molt, increased protein and rest period will have your hens laying strongly when spring arrives. 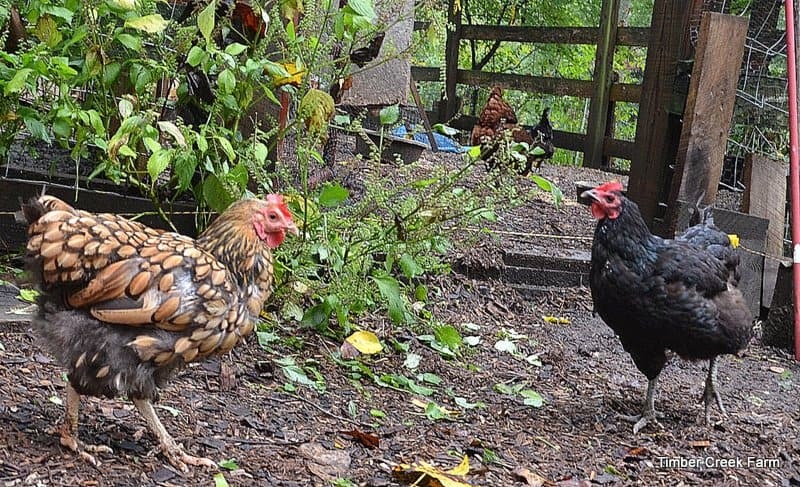 Before the molt even begins, make sure your chickens are in the best physical condition. If you follow a natural worming protocol, continue with that as the summer winds down. This is not the time for any other stress factor to rear it’s ugly head. Making sure that your flock is receiving the best level of nutrients will keep them in good health during molting. Feeding increased protein levels during molting can strengthen the recovery and feather growth. This can be easily handled by supplementing the regular layer ration with treats that are high in protein. Tasty Grubs to the Rescue! A delicious and nutritious way to keep the flock happy and increase their protein intake is to feed grubs and mealworms. The folks from Tasty Worms offered me a bag of dehydrated grubs to give to my flock this summer and fall. I can, without a doubt, tell you that the flock appreciates that I said yes to the offer. I have been feeding a treat of Tasty Grubs the last two weeks. Although we are not in full molt yet, a few of the chickens are starting to show feather loss. Not only do the Tasty Grubs smell good, you see from this photo, the chickens went crazy for the taste. I was told by TastyGrubs representative that the chickens might need to get used to Tasty Grubs. Not these chickens! They were so excited and dove right into the bowl. I had to pick up the bowl and distribute the worms around the yard to get them to slow down. I wondered if it was just the fact that Tasty Grubs are a new product for us to give as a treat. The excitement over the Tasty Grubs continued with each time they have the grubs. Meal worms have been a favorite treat for many years. Feeding grubs and mealworms is part of my usual spoiling of the flock. After all, I want my chickens to stay healthy and to know that I bring good things. As we head into molting season, I will be grabbing the grubs and mealworms as I head up the hill to the poultry coops. Even our picky small flock of ducks enjoys the treat of grubs and mealworms on occasion. Ducks molt too! The chickens in coop 2 are almost to laying age. They also enjoy a snack of grubs! 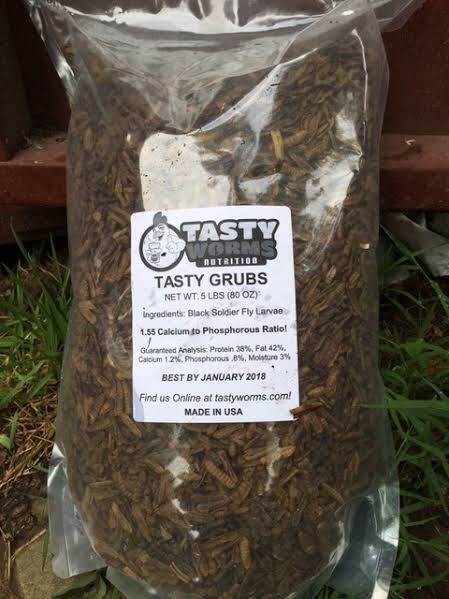 Tasty Grubs are the newest product from Tastyworms.com. The guaranteed analysis for Tasty Grubs is Guaranteed Analysis: Protein 36%, Fat 31%, Calcium 4%, Phosphorous .67%, Moisture 9%. Not only a good source of protein, but Calcium and Phosphorus for health and egg production, too. Made in the USA, and no stabilizers, preservatives or other additives find their way into Tasty Grubs. Don’t handle molting chickens too often. The pin feathers that are growing in are uncomfortable. Chickens actually feel some pain when picked up during molt. Handle the molting chickens only when necessary. Stick to the normal routine as much as possible. Switching routines causes stress, as does lack of water, poor nutrition, extreme heat or cold. Broody hens that are also molting are going through a double stressful situation. Often a broody hen will trigger molt just by the lowered food and water intake she has during egg setting. Reduce or eliminate stress from other sources. If you know that the family dog sniffing around the coop causes an upset, keep the dog away from the coop area. Be extra vigilant against predators at this time of year. Fox and raccoon are hunting, to put on weight for the winter. An attempted attack at this time will lead to an even higher level of anxiety in the coop. A huge benefit of Tasty Grubs, dried black solider fly larvae, compared to others who are trying to produce their own version. They do not use any manure or garbage to feed our black solider flies. These flies will eat just about anything, as many flies do. Some companies will cut costs and collect food from dumpsters or manure from farms to feed the supply. But not Tasty Grubs! They are feed pre-consumer food residuals (distillers grains, cookie meal) No bovine or ovine ingredients. No stabilizers, preservatives or other additives are added. All natural, dried fly larvae. Sounds almost appetizing doesn’t it? I received no monetary compensation for conducting the taste test review with my flock of chickens. I was given a free bag of Tasty Grubs to use for this purpose. It has been a pleasure to work with the company and I want to say thanks for allowing my flock to experience this yummy treat. 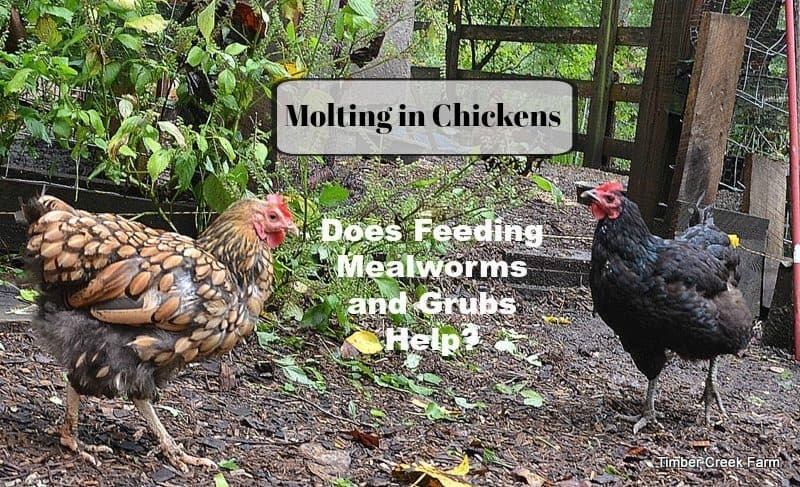 Can feeding grubs and mealworms help your chickens get through a molt faster? My girls lay be breakfast and amuse me daily. They deserve wormies!!! This is my hens and my first molt to get through. I’m confident that Tasty Grub will help us get through it. We have quite a few chickens and provide eggs for our church family. We are always looking for ways to keep the chickens healthier. It sounds like the grubs would be a wonderful addition to their diet. My chickens would love a bag of Tasty Grub! This would be a great treat for them! My daughter is still trying to convince me to get chickens that she can hug. Meanwhile her father is raising his first brood and they are going through a molt. He raises his own meal worms but Tastyworms look like a much easier way to supplement their diet. I have yet to find any here, we have 1 feed store. I think our chickens would love this ! They are all new layers and want to keep them happy and healthy ! The girls all work very hard. The peachicks would probably love trying these as well. I know that going near the pen with mealworms induces near hysteria in my chooks. I would bet grubs would nearly start the food riots. Would love to try these. Thanks for the opportunity to win some! 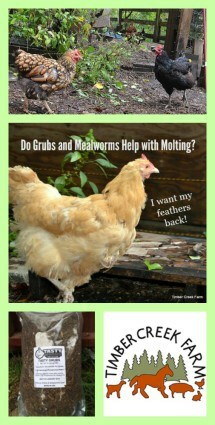 Thanks for all this info on molting. I would love to try this for our chickens since I have never treated them special during a molt. I have been meaning to raise meal worms for them–it is on my big to do list. I signed up for the TastyWorms newsletter. My run looks like a feather pillow exploded! The “girls” would greatly benefit from TastyWorms. My flock would go crazy over these! I have turkeys, peafowl, geese, chickens and pheasants who love treats in the morning. My chickens now race to get to the grub bowl!! I love my chicks! & they would love the grubs! This is my first year raising hens. We need all we can get to make it a great first year! Yes they are beginning to molt and I appreciate the info. about needing more protein. I ordered some tasty grubs and they just came today. Egg production has dropped a bit, but, bless their hearts, they hang out under a large bush in their yard and have done better than expected. They loved the 2 watermelons I bought them. what worms and grubs??? yes please!! The tasty grubs would be for my mom’s chickens they are the first chickens she has had in over two decades, so they would help her young flock a lot. I have 9 fun-loving DUCKS that enjoy a great treat. They send their love and quacks with hopes for some yummy winnings! 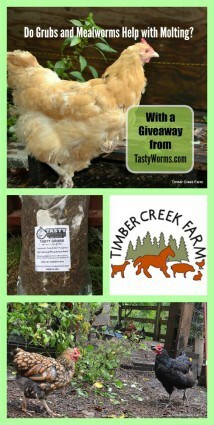 The folks at Tasty Worms are terrific and my chickens, turtles, duck and quail love the meal worms and grubs. It is a pleasure to watch them munch ’em down. My aviary of finches also love grubs and mealworms!!! My 5 lovely hens absolutely love treats! When it’s time for them to go in the coop, I stand in the doorway and ring a little bell. They all come running and flapping to see what the treat bowl has to offer. They are tremendous birds! Also, these worms would be an awesome supplement for quail as well! They require a high protein diet to avoid picking and to ensure proper growth.